The Days of Johann, an agility dog! : Mum and my Raise A Green Dog blog are in Dog World Magazine! Mum and my Raise A Green Dog blog are in Dog World Magazine! 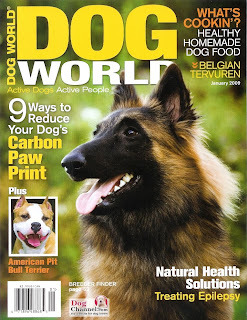 Sometime this past Summer, we got an exciting call from a writer working with Dog World magazine. She was doing a story on how a family can help reduce their dog's carbon pawprint. She did a Google search and found a link to my Raise A Green Dog blog, and emailed us. We talked with her for about two hours and had a blast telling her all the things we do in our life to be more green. Turns out she's very green herself, so we had a lot in common. We saw the other week that the issue had come out on the newsstands so we ran and got a copy to see how the article turned out. We are super pleased and excited. Wendy did a fantastic job on the article and shared lots of important information on how a family can help their pup be more green, be more healthy and help the environment at the same time. Here's a pdf link to the article, or you can click on the images and enlarge them for a better view. Woo Hoo you have a famous blog! That is so super cool! I'm proud that I know you and your green dog blog! Hey come by the Mum's tip tail blog and check out the Muffin Tin Game! I'm sending your post to my BT furiends Eva and Brice - both of them are much better looking than this khover khanine!